When the DC New 52 first began, and we all were able to get our paws on the first few issues of this particular series, it seemed as if there was a unanimous outcry of “I want to kill Damian Wayne.” And perhaps some of you still do. 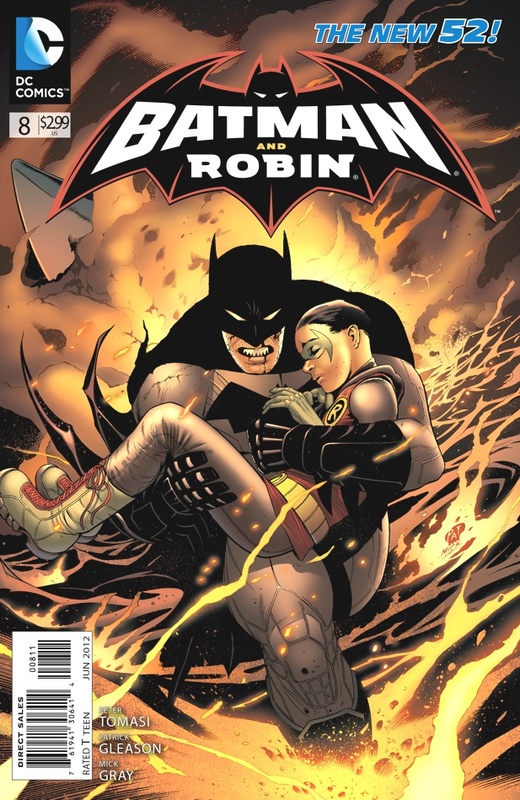 But I on the other hand have grown quite fond of this bloody father and son tale, and in this particular issue of Batman and Robin, my affinity for this run has grown significantly. There’s something truly emotional and beautiful happening within the pages of Batman & Robin #8. Now that we seem to have moved past Damian’s “bratty” stage, we are beginning to learn just how vulnerable he and Bruce truly are when either of them are threatened by one of Gotham’s many villains. This issue is essentially one of those “in-between” or “interim” issues where we are treated to a little bit of down time with our characters as they rest and heal from their latest exploits. What I truly enjoyed about this issue is the display of love and compassion shown by our three title characters: Bruce, Damian, and Alfred. If anything, this issue is further proof that it is indeed Alfred Pennyworth who holds Batman and the Waynes together. More often than not he’s given a panel here and there so we don’t forget that he’s part of the Batman universe, but in Batman and Robin #8 Pennyworth is front and center and I couldn’t be happier for it. The fact of the matter is that we’ve just participated in a pretty defining arc what with Damian going AWOL, hot on the trail of the books signature villain, Nobody. So now it’s time for everyone to take a breath, collect what is left of their strength, confess their sins, and gather the stones and sand that will be the building blocks of a better partnership between father and son. Though, like any good Batman tale, you know that this calm will not last very long and we will very soon be out on the mean streets wreaking vengeance for the innocents of Gotham. Buy it. In my humble opinion, of all of the Batman books on the comic market today Batman and Robin is second only to Scott Snyder‘s Bat book. If you can get past the first two issues where Damian is dam near intolerable you’ll find that later on this series is absolutely worth every penny of your hard earned cash.